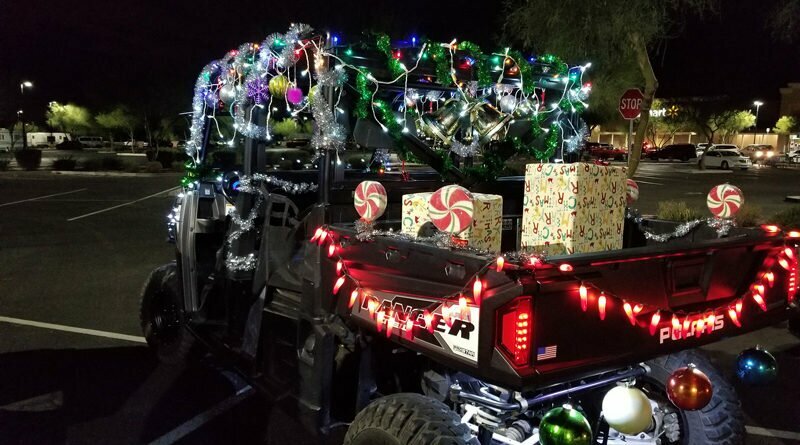 Two years ago, a few dozen off-road vehicles, mostly side-by-sides (SXSs), gathered for an informal Christmastime parade through parts of Anthem. Last year, 135 vehicles turned out. This year, more than 200 individuals and families are expected to parade their lit-up vehicles on a route that will aim to traverse some of the streets with the most impressively decorated homes. Owners of SXSs, UTVs and Jeeps who wish to light up and otherwise decorate their vehicles are welcome to participate. Vehicles must be street legal. Details on how to participate are available on the group’s Facebook page (drivers can click “going” to indicate their planned participation). The route will be posted in social media in coming days, Brown said. It will wind through Anthem Parkside on each side of I-17. She encourages people along the route to watch from their front yards and others to find a safe spot, such as a school parking lot.